Preheat the oven to 350°. Grease an 8-by-4-inch loaf pan. In a large bowl, whisk the 1/2 cup of canola oil with the molasses, brown sugar, eggs, ginger and cranberries. In a medium bowl, sift the flour with the baking powder, baking soda, cinnamon, cloves and salt. Whisk the flour mixture into the molasses mixture until well blended. Scrape the batter into the prepared pan and bake for about 50 minutes, until a cake tester inserted in the center comes out clean with a few moist crumbs attached. Transfer to a rack and let cool for 10 minutes, then unmold the gingerbread and let cool to room temperature before slicing and serving. 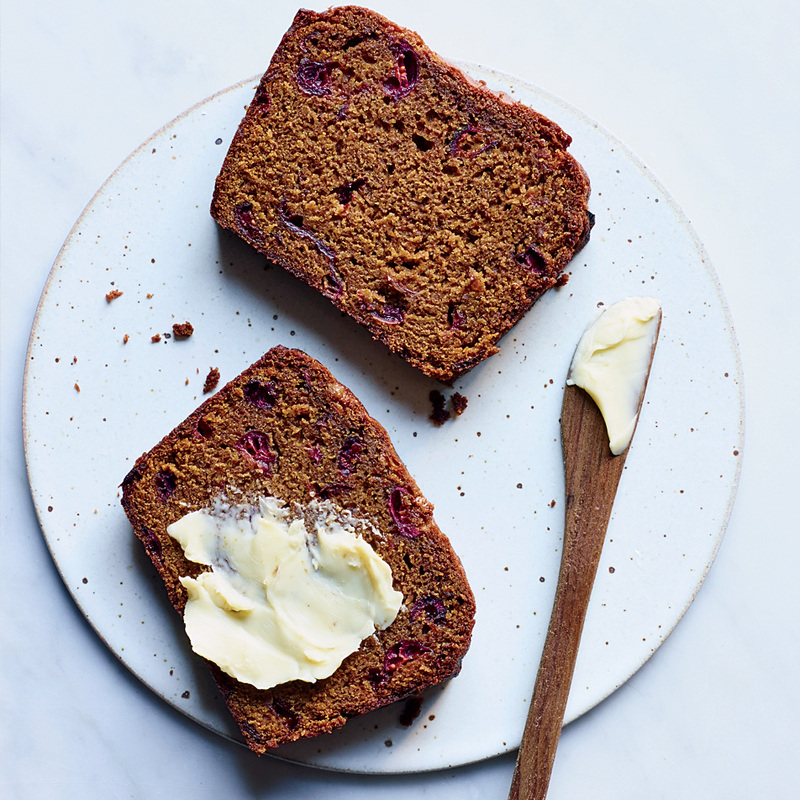 The gingerbread can be stored in an airtight container at room temperature for up to 3 days. Review Body: I've made this once nad am about to make it again. My entire family of five loved it although it works better if you use a 5x9 pan. If you have the smaller size they recommend, then only fill it 3/4 of the way or it will overflow. Review Body: Frank G. Cirillo I made this recipe for the family, and they liked it a lot. Keeping in mind some of the other reviews, I put the batter into two loaf tins and adjusted the cooking time to about 35 minutes to compensate for the smaller loaves, and they came out perfect. There was only one suggestion, two of my kids preferred the gingerbread loaves without the cranberries, but, personally, I like the cranberries. Review Body: this recipe sounded great, but even after cooking it 55 minutes, the middle was almost raw. it was as if 3/4 C of molasses was too much because it was oozing. I ended up slicing the ends into bite-sized pieces but most of the cake had to be thrown away. i used a 9x5 pan. any thoughts? Review Body: How many breads per this recipe? Review Body: "ACTIVE: 20 HR / TOTAL TIME: 1 HR 20 MIN" active 20 HOURS? sure. mebbe a typo? Review Body: Great recipe idea. I love how this flavour sounds very tasty :) How many will this make per recipe?